I am always bothered that it takes me so long to put on my makeup, and realized finally that it was because it takes so long to find my items among the pile. Lip liners often look similar to eyeliners, the new slim lipsticks and the handles of brushes look similar to mascara containers, etc. While trying to find something better to hold my most often worn articles upright and SEPARATED, I found a bag of poly-pellets (for making weighted stuffed dolls). You can fill any size container you have, depending on your own needs. Long thin items stand upright best in this, and it's easy to place matching items together. Now my morning routine takes about half the time. I've used a plain container in the photo, but to hold only the thinner articles or your brushes, a single pretty stemmed glass would be nice for just liners or brushes, or maybe a grouping of different height glasses from the thrift store. My own un-decorated rectangular bin looks a lot better than my messy old flat makeup tray did, but you could really get creative! I have never heard of "polly pellets" but I have been doing something similar for years. I group eye liners and mascara in one short vase, brushes in another. All other "everyday" makeup items go in one bag that can go in my purse in a time crunch, "everyday" lip liner, one gloss, and my favorite lipstick stay in a pouch in my purse. Things that I only use on special occasions go into another bag. 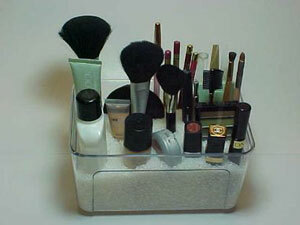 I agree that the key to reducing the time it takes to put on your makeup is having things organized. Another part of being organized is getting rid of items you no longer use or that don't match your color. I've also learned not to allow myself the luxury of buying too many different colors. Yes, they're fun. But, the more stuff you have, the more time it takes to figure out what you want to use! now thats a thrifty idea! great idea thanks! Could you use rice instead? I'm not sure if this would work but might be cheaper if it did. Yes, I thought it was rice at first. You could also use pop corn, or even wheat or lentils. Whatever is at hand. If you do use a natural grain, bung in lavender and a bay leaf to discourage crawlies.